James Vaughan celebrates scoring for Everton. In the latest edition of The Blue Room big interviews, Matt Jones and Paddy Boyland spoke with former Everton striker James Vaughan. Although the forward’s career at Goodison Park was blighted by injury problems, Vaughan, now of Bury, enjoyed some memorable moments in the royal blue jersey, including a winner against AZ Alkmaar in the UEFA Cup and a crucial penalty at Wembley in the FA Cup semi-final win against Manchester United in 2009. But Vaughan is mainly remembered for his very first contribution as an Everton player, when he became the youngest goalscorer in Premier League history against Crystal Palace in 2005, aged just 16. We started by asking him about that incredible day. You can also listen to the interview in full at the bottom of the page. 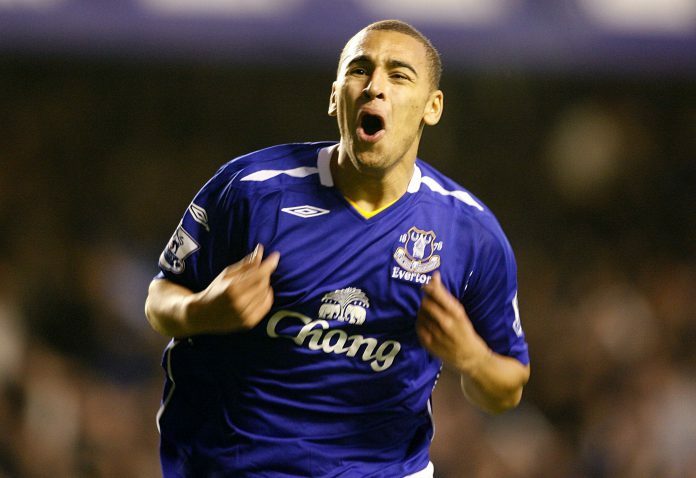 RECORD MAKER: James Vaughan becomes the Premier League’s youngest ever goalscorer against Crystal Palace in 2005. Matt Jones: Thinking back to the goal you scored in 2005 against Crystal Palace, it’s still etched clearly in the mind of a lot of Evertonians. What are your memories of that day? James Vaughan: It’s a bit strange really, I don’t remember much! We went a couple of goals up and I had a feeling I might get on because I’d been on the bench a couple of times before that. Then obviously I got the nod to go on and then, it’s all a blur from there, really. MJ: That team obviously went on to do very well in the Premier League that season, finishing fourth. You were involved towards the end; why do you think that group upset the odds? JV: I think it was an old school group of players who just wanted to work hard and do well for each other. There’s not been many groups like it; a set of lads who just fought for each other until the very end and you saw the results of it. Paddy Boyland: As you mentioned there was a really good group of professionals around, including Duncan Ferguson. How big an influence was he on your career at that point? JV: He was massive at the start, even just little things that people don’t realise when you’re on the pitch. Like if you’re up against a big centre-half, he’s always protecting you and if they kicked you, he’d kick them for you! He was just a good person to learn off really, even in training you’d see how good he was at finishing and you’d try and work as hard to be as good as him. MJ: Before the 2004-05 season Everton sold Wayne Rooney to Manchester United. As a young lad were you thinking “this could be a chance to push on myself” and force your way into the first-team squad? JV: No, not really because I’d only just come out of school! It’s just a case of doing your scholarship and seeing where that takes you. But that pre-season I started playing for the reserves and Andy Holden started pushing me on quite quickly. I could see that if I put the work in I’d get that opportunity and thankfully I got that through a few injuries and suspensions. PB: It was David Moyes that brought you into the team in the first place; he has a reputation in certain quarters as a manager who doesn’t like to give young players an opportunity. Was he a positive or frustrating influence on your career? JV: I could only say a positive influence really. Not just myself, there were a lot of lads around my time who made their debut like Jack Rodwell, Victor [Anichebe], Jose [Baxter], Dan Gosling; so for me there were always young lads given an opportunity. I was certainly given a good opportunity. Even with injuries, when I came back I was always with the first team and if I trained well enough I always got the games. 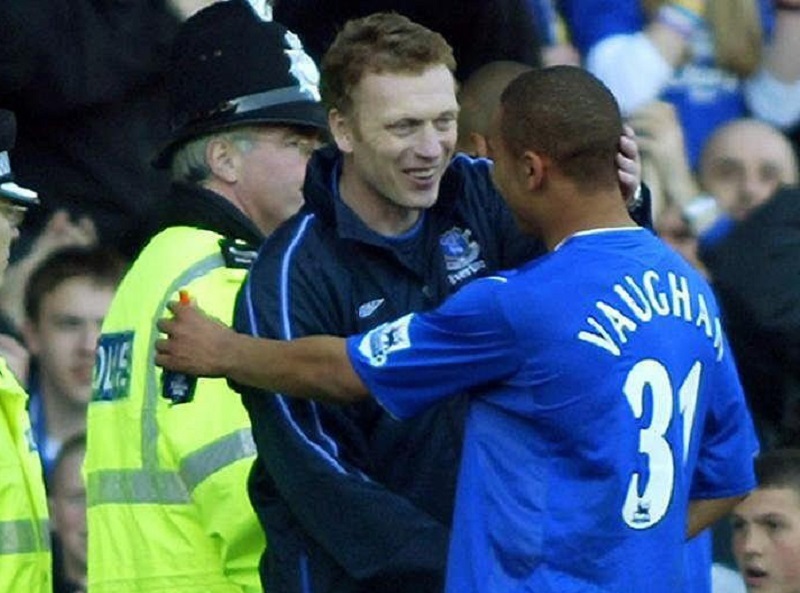 CONGRATULATIONS: David Moyes congratulates James Vaughan after he became the Premier League’s youngest ever goalscorer. PB: There were some other big-name strikers that came in during the Moyes years like James Beattie and Andy Johnson. When they came to Everton they had big reputations, but it never worked out for them. Was that down to the way Moyes wanted his strikers to play? JV: If you look at the way we used to play it wasn’t a case that we were all superstars, scoring goals wasn’t enough for the striker. They had to work a lot harder and do a shift for the team. The gaffer understood that and that’s why some struggled to score goals. But I don’t think it took anything away from the way they played, if anything it made them better because they did more for the team. MJ: Looking a little further ahead, was one of your most memorable times at Everton the UEFA Cup campaign in 2007-08 and the winning goal you scored to beat AZ Alkmaar—chasing a record 33rd game unbeaten in Europe at home—3-2 in the group stage? JV: Yeah definitely. When you’re in it you just think it’s another game and another season. But when you look back now it’s one of the things you remember the most, playing in Europe is not something people get to do all the time and I was fortunate to do it. With the Everton fans travelling away like they did every game it was an unbelievable thing to be a part of. PB: A year later you scored a really important penalty in the FA Cup semi-final shootout win against Manchester United at Wembley. Your reaction that day was brilliant, it’s the way I would have responded myself! Can you give us a few thoughts on the day itself and how you felt after scoring that goal? JV: It was unbelievable really because I’d had a tough time. I’d been out injured for about four months before that and it was one of my first games back. In that time my nan had passed away, so there was a lot of emotion coming out. But the day itself, it probably will be the best day of my career. It was an unbelievable day and I think I showed that with my reaction at the end! MJ: That image from the day of yourself—jumping in the air, arms out, elated—is one we see so often. I was in the ground and when you walked up to take the penalty there were no doubts about you scoring. Did you feel under pressure? JV: I was confident to score. But it was weird, because I wasn’t nervous at the time and then when I watched it back in the evening I got this sense of nervousness! Even though I knew I’d scored it I felt quite weird watching it! But we’d practised them all week and it was just a great feeling. Something that I’ll cherish forever. PB: Who allocated the penalty takers that day, because you were not a senior member of the team at the time? Did you put your hand up and say “I’m confident to take this” or was it a case of Moyes and Alan Stubbs allocating the penalties to yourself? JV: I think there were four of us who put our hand up straightaway, but the gaffer wasn’t too keen on me taking one because, like I said, I’d been out for a while to be fair. I’d say “I’ll take one” and he kind-of blanked me! Then I said it again and I remember Joleon [Lescott] saying “go on, let Vaughany have it” so in the end I got one and then luckily I managed to put it away. MJ: Obviously the cup run ended in disappointment. Was it a case of Everton coming up against a pretty awesome Chelsea team that day? JV: Yeah it was. We got a good start and went 1-0 up, but like you said it was one of the best Chelsea teams there’s been for a while. When they’ve got players like they did have that day it was always going to be tough. But we still wanted to go to the game and win, and we were all devastated we didn’t get the win. WHAT COULD HAVE BEEN: Vaughan’s Everton career was blighted by injuries. MJ: You briefly mentioned the injuries you suffered throughout your Everton career. It must be so frustrating looking back at the problems you had and the unique nature of them, like the severed artery against Bolton? Unfortunately I did get a lot of injuries but it’s just one of them things; I’m grateful for the opportunities that I did get. PB: You went out on loan a number of times from Everton. If we look at that in terms of your own career, do you think it was good for your development? JV: It was always me pushing to go on loan to go and play and figure out my style of play, not just come off the bench. I did well on a couple, not so well on others, but it was all a good learning curve. MJ: Looking at the current Everton team from afar, what have you made of them under Ronald Koeman? JV: It’s taken a while from the change from Moyes to [Roberto] Martinez to Koeman but I think they’re starting to look a lot more solid. People like Ross [Barkley] is maturing into the player that we all know he can be, [Romelu] Lukaku is getting older and more experienced. They can rely on them players now instead of being young potential. If they keep the group together I think there’s a massive chance of doing some good things. PB: If we look at Lukaku, how highly would you rate him in world football at the moment? JV: His record speaks for itself really! There’s nobody of his age who has scored as many goals as he has. You look at the physique of him, he must be a nightmare to play against and he’s only going to get better with age. Hopefully he can stay at Everton for a long time and bring some success. MJ: You mentioned Barkley too, who is beginning to find some form again. Do you understand the pressures he goes through as a youngster breaking into the team? Are the Everton fans a tough crowd to play in front of? JV: They’re a tough crowd, but they’re the best! But I think Ross is a victim of his own ability. People see how good he can be and how good he is. So when he doesn’t play to that ridiculous level he can do, people aren’t happy. It’s only because of how good people expect him to be and that’s only a compliment to himself, really. PB: A former team-mate of yours, Jose Baxter, is set to rejoin the club at the end of the season on a one-year deal once his ban is up. Do you think that’s a good move from the club or a mistake? JV: I think it shows the class of the club. I think they can see some who has maybe struggled a bit and taken responsibility to look after one of their own, which is something they’ve always done. It can only be a positive and it’s not often that you see that loyalty from a club; I’m sure he’s very grateful for the opportunity he’s getting. 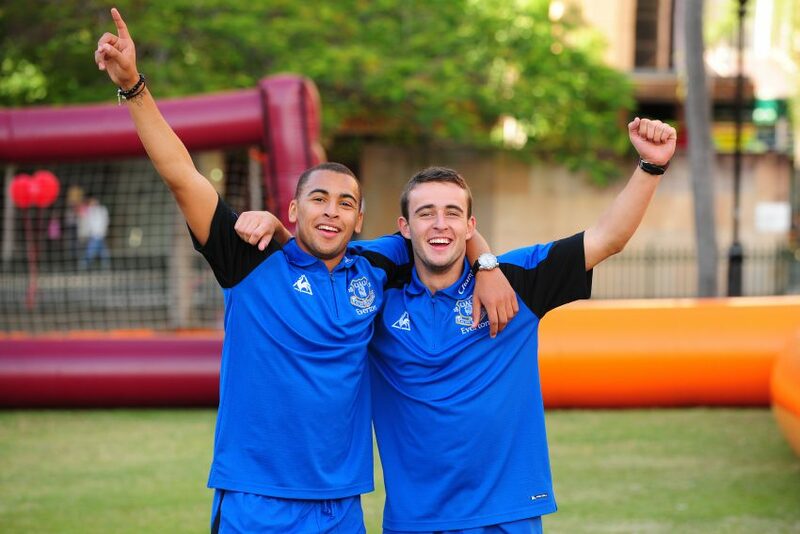 GOOD FRIENDS: Vaughan is happy to see his friend Jose Baxter back at the club. PB: Another player you know well is Victor Anichebe. Do you still speak to him and what do you attribute his positive start at Sunderland to? JV: Vic is still my best mate really. He was the best man at my wedding and godfather to my little boy. We’re still really close. Anyone who knows Victor will know good he can be. If you see him in training some of the games he plays in, he’s an unbelievable talent. If anyone can get the best out of him it’ll be Moyes and we saw that early on. Unfortunately he’s injured at the moment, but if they can get him back towards the back end of the season he’ll be massive for them. MJ: Looking at your own career currently, you’ve scored 18 goals in 25 appearances for Bury this season. You seem to be enjoying your football at the moment? Yeah it’s good. It’s good to be back playing and scoring goals again, I’m enjoying it. Long may it continue!